We are offering Reaction Tanks. We are manufacturing and supplying bio toilet (Retention Tank) to Indian Railway. 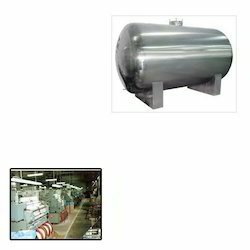 Our firm is engaged in presenting a broad series of Industrial Storage Tank. Owing to high demand, experts make this product in numerous structures that meet customer’s demand. We are offering a wide range Day Tank to our valuable clients. Our product range is manufactured from high grade raw material at our well-developed fabrication division as per the international quality standards. 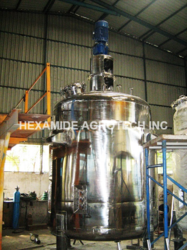 These tanks are used for storing various material as per the requirement of our clients. Alakli Tanks, Water Rinse Tank, Brush Roll, Quanching, Quench Holding etc. 9 tanks with Squeez Roll assembly and Exhaust Ducting for Electro Static Coil Galvanising and Colour coating line. Gas Projects India P. Ltd.
Gas Projects India P. Ltd. has built its reputation on its consistent production quality. This quality stems from the Company Policy of continual improvement and development of process to the latest technology which allows it to assure its customers of total product reliability. We are one of the renowned manufacturer and exporter of the Industrial Tank Shell. These tanks are mainly used for the storage of water, oil and gas. These are manufactured from the premium quality of raw materials. These are easy for installation. We have in store for our clients a wide range of Storage Tanks that are appreciated for being corrosion resistant and durable. Our sturdily constructed products an easily withstand temperature fluctuations and pressure modulations. The products are manufactured using high grade MS or SS that are procured from trusted vendors of the market. We offer highly effective Industrial storage tanks that are developed using high quality MS and SS. Our tanks are widely used in various industrial and commercial application for the purpose of storing liquids and gases. Widely appreciated for its features of corrosion resistance, high strength, and robust construction, the product can be customized as per the client’s specifications.